Where’s the media on this? 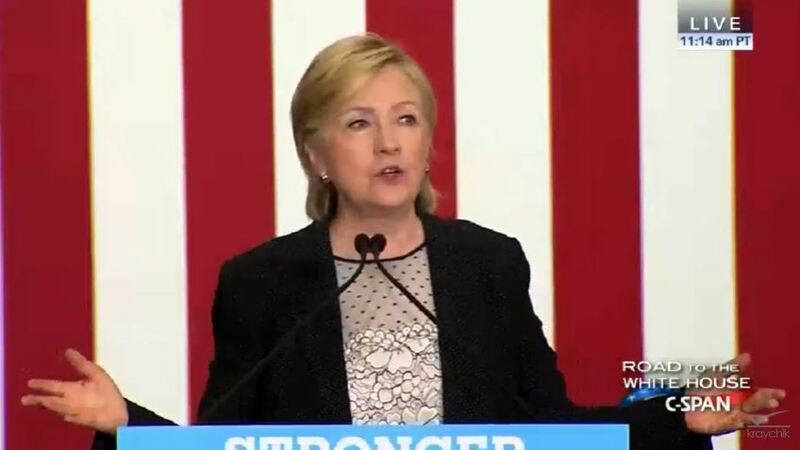 While speaking at an event in Warren, Michigan, on Thursday, Democrat Hillary Clinton said that Donald Trump’s death would be good for America and the economy if the government was allowed to dispose of his assets. According to Clinton, arguably the most evil person to ever be nominated by a major party for the White House, confiscation and redistribution of his wealth is much preferable to anything else. The audience applauded Clinton as she pushed Marxist tenets of class warfare and government confiscation and redistribution of wealth. Her justification for such policies is that “99.9% percent of Americans” supposedly do not benefit from the absence of taxing the deaths of millionaires and billionaires. Clinton also called for more taxes to be levied on multimillionaires, saying several times that corporations and the “super rich” should pay a “fair share” of taxes. Echoing left-wing demagoguery about “The Buffet Rule,” Clinton said that millionaires and billionaires should never pay a lower rate on their taxes than their secretaries. Clinton was presumably referring to average rates of federal income taxation, although she did not specify which taxes she was referring to. No explanation was provided as to why secretaries were selected as opposed to other categories of employees. Imagine the outrage that would ensue if a Republican suggested that the death of a wealthy Democrat would benefit the country. Clinton, however, gets a pass. But if we use the “standard” set by the Democrat-media complex, could we not argue that Clinton wants Trump dead? Why yes, we could. After all, we now have Hollywood moonbats suggesting Trump and his supporters be “cleansed” from America. Previous articleRush Limbaugh wonders: How does Will Smith plan to cleanse Trump, supporters from America?